Whenever I tell people that I do triathlons, I am usually met with several questions, including but not limited to the following gems: You do that for fun? That’s the thing with the skiing and the shooting? How do you do that on one leg? Oh, so you enjoy pain and misery? Are you going to do an Ironman? What’s your strongest discipline? Out of all these questions, the one I hate the most is the last one. The thing is, most triathletes have a strong background in one of the sports, and then just pick up the other two either for the purposes of cross-training or out of boredom. I really don’t have a history in any of the disciplines, unless you count the week of track that I did in sixth grade. When I first started doing this stuff, I wasn’t looking to be good—I was just trying to figure out how to turn my bike 90 degrees without crashing it, and conditioning myself to jog more than five minutes before reaching my maximum heart rate. So when people asked me about my strongest leg, I answered truthfully and said that I was just acclimating myself to the sport and figuring out my strengths. Then I decided that this answer made me sound kind of lame, so I started to make up answers depending on how I was feeling that particular week. At this point, I like to think I’m relatively well-versed in all three disciplines, and yet, I still don’t think I necessarily have a “strong” one. Basically, I’ve deduced that I am not great at any of them, but I’m good at all of them. This, I believe, has actually been advantageous to me. Because I don’t have any natural inclination for any of the three sports, I am in a position where I can pretty much choose which one I really want to develop. With that in mind, I have decided that I want to focus on making the cycling leg my strength. Over the last few months, the bike has become my favorite discipline (once I got past the pain that it always seems to induce in my sit bones, quads, shoulders, and back, I realized it was actually kind of fun). From a strategic standpoint, focusing on the bike makes a lot of sense. It always occurs between the swim and the run, and is always the longest leg of any race. Excelling on the bike also makes sense given my personal body mechanics. Compared to other above-knees, my residual limb is fairly long, with all of the major muscles still intact. Because of this, I’m actually able to generate quite a bit of power on my prosthetic side, which not only makes me to go faster on the bike, but also allows me to save energy on my sound side so that I can utilize it better on the run. Although I lived on my bike as a kid (it was my favorite recreational activity growing up, other than pogo sticking and Skip-It), it was one of the things that I had to give up when I lost my leg. I tried riding a bike once about a year after my amputation, but my prosthetic wasn’t able to stay on the pedal, and I hated the feeling of being unstable and off-balance. When I decided I was going to start doing tris, I knew that the first thing I needed was a prosthetic specifically designed for biking. The cycling leg that Dave made me has cleat of the bottom that clips right into my pedal on the bike. This is great in that it enables me pull up on the pedal, increasing power efficiency. However, it as also led to many a crash that all cyclists have gone through—that awkward moment when you can’t unclip fast enough, and you fall to the side in slow motion. And for some cruel reason, there are always at least 5 people around to witness these falls. Always. Last summer, I still wasn’t ready to drop a small fortune on two wheels and a frame. 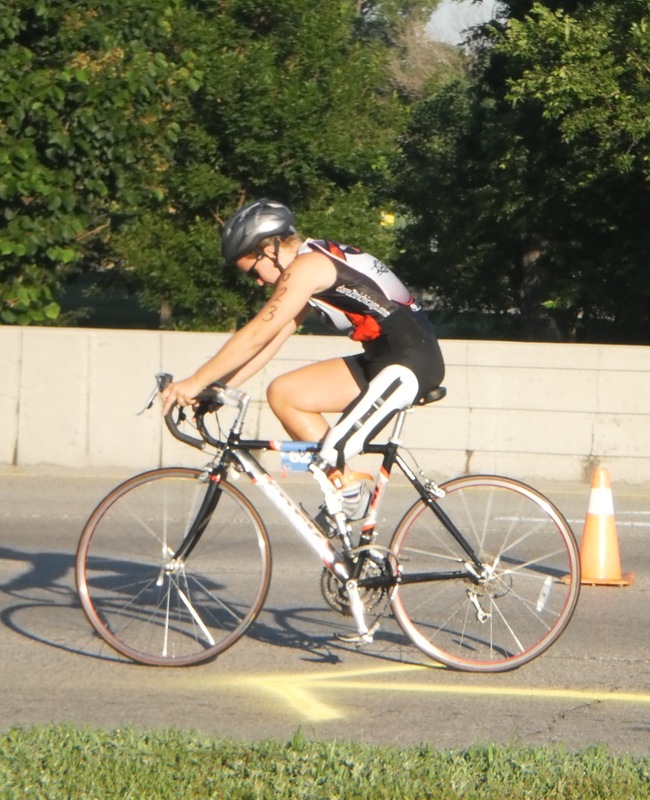 Luckily, dare2tri had a road bike donated to them through Chicago Tri Club that they allowed me to use. As I mentioned in my last post, I didn’t end up getting my bike/biking leg until 9 days before my first triathlon. I took it with me to the weekly dare2tri practice at Northerly Island on what ended up being one of the hottest days of the summer. I was questioning my sanity for being outside in the middle of an unshaded field when it was 97 degrees, but I also knew that this was my only chance to learn how to ride this thing before my race. I had no idea what to expect getting on the bike for the first time, but after getting a little momentum by pushing off the ground with my sound leg, I clipped into the pedal and rode the entire 1.6 mile loop around the island. I now understand why people always use the cliché “like riding a bike.” Even after so many years of being off the bike, the second I got on the saddle everything came right back to me. After learning the basic bike-handling skills, I spent the rest of summer riding as often as I could. I logged many miles on the lakefront path, where I got really good at dodging runners, moms with strollers, and old men on mountain bikes. I also spent a lot of time at Northerly Island and discovered some great trails in the suburbs. In October, I started taking Computrainer classes with dare2tri coach Stacee Seay, and some of my dare2tri friends. Everyone sets up their road bikes on stationary trainers, which are connected to a computer programmed with one of Stacee’s punishing workout profiles. Unlike spin classes where cheating is easy (you know you just pretend to rotate the knob when the instructor says to up the resistance) the Computrainer actually gets harder if you slow down. Similar to treadmills, it is able to simulate different terrain, making it the next best thing to outdoor riding. The class is in the city every Wednesday at 5:30am. I am fully aware that going to bed at 10pm so I can wake up at 4am is considered lame by all college standards, including Northwestern’s (sidebar: I knew my life had reached a point of absolute ridiculousness when before my class one morning, my roommates were taking/offering me shots as I ate my pre-workout banana and peanut butter). But the class has become a social event in itself, and I find myself looking forward to it every week. In addition to the Wednesday class, I’ve started to do Computrainer a couple more times a week, both in groups and on my own. I can truly feel a difference in my biking since I started taking the class. My pace is faster, my power is higher, and my endurance is stronger, and I’m so excited to see how the changes I’ve made indoors will translate to the real thing once I get back outside. I’m continuing to ride on the bike that was donated to dare2tri, but the frame is a bit too small for me. This wasn’t a huge deal when I was first starting, but I’m now at the point where a well-fitting bike will make a big difference in my performance. A few months ago, I applied for a grant for a new road bike through the Challenged Athletes Foundation, and I’m currently waiting to hear if I’ll be granted the funding. So when people now ask me about my favorite discipline, I am able to respond truthfully, confidently, and with an actual answer. But that’s not to say that the bike will remain my favorite forever. I think that’s the great thing about by relationship with the sport. I still have a lot to learn and have so much room for improvement, and there are many things that my change as I continue to progress. I am excited to continue to get stronger in all three disciplines, and to see how each one evolves in the coming years. Great entry Hails. I love it. I think when people ask which is your strong leg you should respond “that’s not a fair question. I was born with my right one and Dave (the mad scientist) created my left one in his shop.”. Just kidding! You have come so far and your learning curve in all disciplines is huge and happening rapidly. Can’t wait to see what the 2012 season has in store for you. Just stop reading those tri magazines before you get to all that advice about working on your weakest event. Bike is a great strength. Just remember that no matter how many miles you log in the saddle you can’t neglect the other two. Enjoy the greatest sport ever!